The Visual system is one of the most fascinating and complex biological systems possessed by living organisms. It allows God's creations the ability to perceive the world around them. Many people however, are unaware of the numerous parts that make up the eye and its surrounding parts. Sight comes from an intricate process called visual perception that would be impossible without the visual system. Over the centuries, scientists and doctors alike have studied the vast field of vision and done their best to interpret exactly how the process works. As further discoveries on the eye and visual system are made, it is important to keep in mind just how amazing God's power really is. He alone created the process, and imagining life without vision is nearly impossible. The visual system encompasses many elements that make up a whole. The eye, being the most obvious, is only one of the many features of the visual system. In order to fully comprehend how the visual system works, one must have an understanding of the whole system. The eye is connected to the brain, and therefore an extension of the brain. One of the most crucial parts of the brain is the optic nerve. It is the connection that sends signals from the eyes to the brain and vice versa. The optic nerve is formed from the axons of the retinal ganglion cells. They gather in a bundle at the optic disk and create the optic disk at the back of the eye. Each eye has an optic nerve that connects to the optic chiasm. During the visual process, decussation will occur here. This process is caused by the switching of sides of the optic chiasm. Those axons cross so that the left eye is perceived by the right cerebral hemisphere and vice versa. After the optic nerve does its job, the lateral geniculate nucleus comes into play. This is one of the first steps to vision. Once the signal is in the nucleus, it then projects to the primary visual cortex. The eye itself is one of the most fascinating pieces of God's handiwork. It allows humans the ability to perceive their surroundings. Many would even argue that the sense of sight serves as the most important sense humans have. This being said, it is extremely hard to comprehend how some people can live without such a crucial part of everyday life. Looking at the eye in sections can produce a better understanding of how it functions. The protective structures act as a line of defense from the outside world. Cornea-The clear dome at the front of the eye. It is a transparent structure that covers both the iris and pupil. 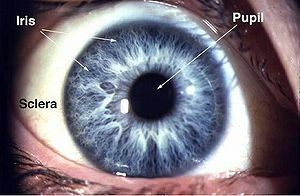 The cornea also is the first point where light hits the eye. Anterior Chamber-Located between the cornea and iris. Posterior Chamber-Located between the iris and the front of the vitreous. Aqueous humor-A fluid that provides nutrients to the eye. Iris-The iris is a colored, circular muscle that controls the size of the pupil. It allows for certain amounts of light to enter the eye. Depending upon the surroundings, more or less light enters, permitting the extent of sight. The varied colors of the iris are a result of the amounts of eumelanin and pheomelanin produced by the melanocytes. The melanocytes are the pigment-producing cells located in the eye. Pupil-A tiny opening at the center of the iris that allows the light to enter the retina. It is black in color due to the absorption of light by the tissue in the eye. Human's ability to process information and see their surroundings is known as visual perception. It is a process that involves many precise steps and specific body parts. God's amazing handiwork can be seen when looking at the intricate process of vision. Even the most advanced studies and scientists are still in awe of the process. They continue to study and find advancements in medical technology. The study of visual perception has been around for centuries. Although people of ancient times were unaware of what modern science has taught scientists, they were still capable of research and study. The two most common explanations of vision were presented by two ancient Greek schools. The theory of emission said that vision is capable when rays emanate from the eyes and are intercepted by visual objects. It was also stated that a refracted image was seen by "means of rays" meaning the image came out of the eyes, traversed through the air, and finally, after refraction, fell on the visible object. This intricate and detailed theory was taught by scholars like Euclid and Ptolemy. The other theory taught was known as the intromission theory. This theory is most like modern teachings of visual perception, but not entirely accurate due to the lack of experimental study during the time period. Aristotle, Galen, and their followers taught the theory that stated vision occurs from light entering the eyes representative of the object. Both these theories were somewhat inaccurate, and it wasn't until several years later that real developments began to occur. Alhacen, the "father of optics" as he was called, was the first to argue that vision was the result of light from objects entering the eye. He was incorrect on one point though. He thought the lens was responsible for the response to light, but we know from modern discovery it is the retina. In addition, he was the first scientist to argue that vision occurs in the brain, not the eyes as many people of the time believed. He also stated that personal experience had a major effect on the things which people saw, and how they saw them. Alhacen's studies paved the way for new discoveries in the future. Leonardo Da Vinci also made a major discovery in regards to vision. His findings were the first to distinguish between foveal and peripheral vision. The next major developments came in the 1930's and 1940's. The Gestalt psychologists came up with laws of organization that would be used for years after. The laws help with the study, showing people view visual properties in patterns rather than many separate parts. The word gestalt actually translates to "configuration or pattern." The laws state six main factors: proximity, similarity, symmetry, common fate, and continuity. These factors help explain the way images are grouped. Although the laws are fact, many cognitive psychologists disagree with them due to the fact that they don't explain peripheral perception. We know now from modern technology and experiments the true process of visual perception. The first step occurs in the retina, when the photoreceptor neurons collect light and send signals to generate electrical impulses to the brain. Next, the brain will process the information it has just received and show us the information. That is what we call vision. Example of the infection Pink Eye. The eye is used constantly throughout one's day, and even though it has ways of keeping clean, airborne infections or irritants are very common. Small particles or bacteria can enter the eye and cause various infections or diseases. Those infections range from viral, bacterial, fungal, to even parasitic. Some infections are more common than others, but one fact true for all is that they are very uncomfortable. Although some are more serious than others, the majority are treatable with either a simple antibiotic or home remedy. Some of the most common complications with the eye are listed below. Stye-The scientific name for a stye is a hordeolum. This small bump is a result of a clogged oil gland or eyelash follicle. This may occur from bacteria buildup or even small debris that have somehow managed to enter the eye. Another common reason would be stress. The bump itself appears on the inside or outside of the eyelid and is small in shape.Watery eyes, itchiness, tenderness, and redness are all common symptoms of a stye. It can seem very annoying, but with proper treatment a stye can be healed quickly. Doctors will either prescribe an antibiotic, or ask the patient to gently massage the infected are. A warm compress also acts as a helpful way of relieving the discomfort that accompanies any stye. Pink Eye-Also called conjunctivitis, pink eye is an infection that causes the conjunctiva to be inflamed. Once one is infected a bright pink or red color occurs in the white of the eye. This symptom is a result of the inflammation which causes the tiny blood vessels in the conjunctiva of the eye to darken. Some other common symptoms include itching, blurred vision, discharge, and tearing. All symptoms can be treated with a simple antibiotic, but conjunctivitis is very contagious and therefore it is crucial for one to stay away from others. Although the infection is only a minor one, if not treated properly it can create a much more serious problem. Choroidal Nevus-A choridal nevus is a pigmented spot usually greyish in color. It is more commonly known as an eye freckle, and can appear on the eye or on the eye's surface. Just like any freckle it is important to pay close attention and watch for any change in color, shape, or size. An eye freckle is normally benign, but choroidal melanoma is a form of cancer that can be very dangerous and found in the eye. Examination by a specialist will surely determine the type of eye freckle and whether or not it is cancerous. Retinal Detachment-The retina is the layer of cells that line the inside of the eye. When a retinal detachment occurs the retina separates from the delicate choroid. This condition is extremely serious and should be treated as such to avoid vision loss or potential blindness. The most common cause of retinal detachment is trauma. It may also occur from changes in the vitreous or even certain diseases. Some important signs to watch for are flashes of light, blurry vision, floaters in the line of vision, or a dark veil covering the vision. Fortunately, there are many treatments a specialized doctor can prescribe to return the eye to its proper condition. These are not the only complications of the visual system. Others include eye twitching, eye herpes, droopy eyes, and scleritis. As well as complications from diabetes and macular degeneration. Like any condition there are treatments for diseases and infections that occur in the visual system. The important thing to remember is to take care of the body and always get the proper medical assistance. Many eye conditions do not require medical treatment, but it is better to be safe than sorry when it comes to such a major part of everyday life. The human visual system is composed of numerous intricate parts. Even though scientists know how the process of visual perception works, they are still learning new facts everyday. One recent study done by scientists showed that the visual cortex of the brain showed very large differences in modulation when measured by fMRI. Other research is also being done to fully determine the visual cortex's properties. Interestingly, any cuts in the cortex will lead to something called a scotoma. A scotoma is a hole in the visual field. People who have this condition are unable to consciously distinguish information, although they can use the information being sent to the scotoma in other ways. As scientists continue to better understand the vast fields of vision and the visual system, they hope to achieve monumental discoveries that will better our world. Doctors hope to use the information for medical purposes, and to help people with eye or brain related problems. ↑ The Brain From Top to Bottom Accessed March 7, 2010. ↑ Visual Perception by Wikipedia. Accessed March 6, 2010. ↑ How We See: The First Steps of Human Vision by Diane M. Szaflarski, Acsessed March 7, 2010. ↑ Eye Styes by Troy Bedinghaus, September 9, 2009. ↑ Pink Eye by Troy Bedinghaus, September, 2009. ↑ Choroidal Nevus by Troy Bedinghaus, September, 2009. ↑ Retinal Detachment by Troy Bedinghaus, September, 2009. ↑ Optic Neuritis by Troy Bedinghaus, March 24, 2009. ↑ Glaucoma by Troy Bedinghaus, July 15, 2008. This page was last modified on 28 July 2014, at 20:53.